As April is National Distracted Driving Awareness Month, AAA Texas is reminding drivers: “Don’t Drive Intoxicated – Don’t Drive Intexticated”. Drivers reportedly caused 95,639 distracted driving crashes on Texas roadways in 2018, according to new numbers released to AAA Texas by the Texas Department of Transportation. While the overall year-to-year results improved, statewide, the statistics also demonstrate drivers across Texas have a long road ahead before the issue is solved (see chart). “Don’t Drive Intoxicated – Don’t Drive Intexticated” is the theme of AAA’s multimedia traffic safety education campaign created to make distracted driving socially unacceptable. New public service announcements (PSAs), which began airing in Dallas/Fort Worth and Houston this week, are designed to help audiences understand that the consequences of using a smartphone while driving are the same as drinking and driving. The campaign targets drivers who would never consider drinking alcohol behind the wheel, and yet, regularly engage with mobile devices that dangerously take their eyes, hands and minds off the road. Research from the AAA Foundation for Traffic Safety found that potentially unsafe mental distractions can persist for as long as 27 seconds after drivers use voice-based technology to dial, change music or send a text message. At 25 mph, drivers travel the length of nearly three football fields during this time. 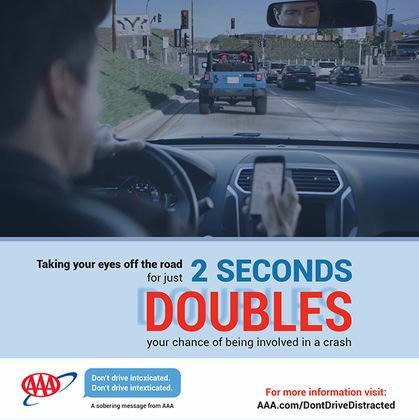 AAA Texas urges drivers to put down their phone and avoid distractions when behind the wheel, especially now during April’s Distracted Driving Awareness Month. Additional research also shows drivers talking on a cellphone are up to four times as likely to crash while those who text are up to eight times as likely to be involved in a crash. Despite the risk, drivers increasingly report using technology behind the wheel. Nearly half (49 percent) of drivers report recently talking on a hand-held phone while driving and nearly 35 percent have sent a text or email. This behavior is in contradiction to the fact that nearly 58 percent of drivers say talking on a cellphone behind the wheel is a very serious threat to their personal safety, while 78 percent believe that texting is a significant danger. About AAA: AAA provides more than 59 million members with automotive, travel, insurance and financial services through its federation of 34 motor clubs and nearly 1,100 branch offices across North America. Since 1902, the not-for-profit, fully tax-paying AAA has been a leader and advocate for safe mobility. Drivers can request roadside assistance, identify nearby gas prices, locate discounts, book a hotel or map a route via the AAA Mobile app. AAA Texas branch offices throughout the state can be found by visiting www.AAA.com. Follow AAA Texas on Twitter: @AAATexas and Facebook: www.facebook.com/AAATexas. Find additional news from AAA Texas in our online newsroom at http://tx-aaa.iprsoftware.com/. *Holding a phone while driving is illegal for all drivers in 16 states and the District of Columbia.